Joining The Stampeder Alumni Association offers many benefits. 2 for 1 price available for 2018 Stampeder season tickets in the red, blue, silver and white seats. 25 % discount from the Stamps' Store. Access to the Red & White Club on game day. Membership with CFL Alumni Association. Opportunity to play in the annual Stamps Alumni Golf Tournament. Born and raised in Calgary, David was drafted in the 1997 Canadian Football League draft and ended up playing 7 years in the Canadian Football League playing in 126 regular season games, 8 playoff games including 4 West division finals and two Grey Cup Championships including the 2001 Grey Cup victory with the Calgary Stampeders. David played university football on a scholarship to Northern Arizona University (NAU) where he was a 4 year starter and a Big Sky Conference all-star. David graduated from NAU with a business degree in marketing management and currently lives in Calgary with his family, working for Husky Energy. 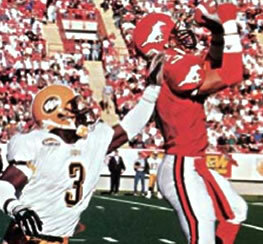 Jackie Kellogg was a defensive back for the Calgary Stampeders from 1995 to 2001 and for the Edmonton Eskimos from 2001 to 2002. During his CFL career he played in 4 Grey Cup Games winning 1 with the Stamps in 1998. He was selected as an All-Star 3 times as a Defensive Halfback. He also played in NFL Europe in 1995 and 1997 winning the World Bowl in 1995 for the Frankfurt Galaxy. He started his playing career with the San Francisco 49er’s in 1994 and 1995. Jackie played his college football at Eastern Washington University graduating in 1994. He started 43 games in his career and EWU winning the Big Sky Championship his Junior season. In 2008 EWU celebrated it top 100 players in Eastern football history as the school turned 100 years old and he was selected as one of the top 13 db’s of all time. Since retirement Jackie has been working in the Oil and Gas Industry here in Calgary as a Senior Account Manager. He resides in Calgary with his wife Jodi and 2 children Trey and Jazmyn. In his spare time you can find Jackie coaching minor football and baseball. Srecko was born and raised in Weston, Ontario. 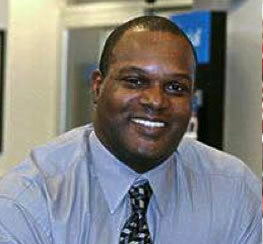 He earned a football scholarship to The Ohio State University in 1985 and won the Big 10 Championship in 1986. He wore #96 and was drafted out of The Ohio State University in 1988 and joined the Calgary Stampeders in 1990. Srecko's 6 year career in the CFL was all spent with the Calgary Stampeders playing in 88 career games and 3 Grey Cups, winning it in 1992. He was 4 times voted the Canadian Airlines Canadian Player of the Game and 2 times the CFL Defensive Player of the Week. This former nose guard was also the team's long snapper in 1994 + 1995 and retired after the 1995 Grey Cup in Regina. 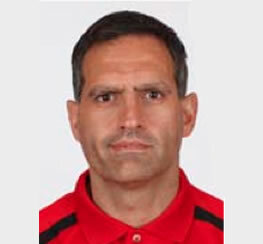 In his post-playing days, Srecko has volunteered as a football coach locally at both the high school level and at the University of Calgary. Since 1994, Srecko has been involved with Calgary Special Olympics and supported many other local charities. Currently, he coaches minor hockey and is the Vice President of the Calgary Stampeder Alumni Association. Srecko joined Baker Hughes Canada in 2004 and enjoys being a Key Accounts Manager in the Oil + Gas industry in Calgary. Romano was a standout offensive lineman who served two stints with the Stampeders - the 1987 season and from 1992 to 2000. The Hamilton, Ont., native was drafted by Calgary in the first round (fifth overall) of the 1987 CFL Draft. 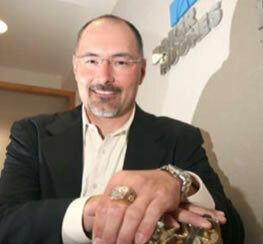 He was elected to the Canadian Football Hall of Fame in 2007. He was a division all-star in 1992, 1993, 1994, 1995, 1996 and 1999 and all- Canadian in 1992, 1994, 1995, 1996 and 1999. He was Calgary's nominee for the CFL Outstanding Lineman award on three occasions and was a two- time winner of the award as the West Division's top lineman, taking home the DeMarco-Becket Memorial Trophy in 1994 and 1996. He won the Presidents' Ring for motivational and leadership skills on and off the field as voted by teammates in 1997 and was added to the Stampeders Wall of Fame in 2008. Romano played on Calgary Grey Cup championship teams in 1992 and 1998. The photo of Romano aboard the Touchdown Horse after the Grey Cup win over Hamilton in 1998 at Winnipeg Stadium is one of the unforgettable images in Stampeders history. He was very active in the Calgary community during his playing career, most notably with the Variety Club.Rocco continues to give back to the community by being involved in various charities, particularly the organization, Inn From The Cold. In between his stints in Calgary, Romano spent time with Saskatchewan, Toronto, Ottawa and BC. He resides in Calgary and is currently working in the Oil and Gas industry for Carson Energy Services Ltd.
After his senior year with the ISU Bengals, Butch signed as a free agent with the NFL's Cleveland Browns in 1988. After getting released, he went back to Idaho State to complete his degree and continue training for another NFL opportunity. Then one day, the phone rang. It wasn't an NFL team, but it was an opportunity. It was the Calgary Stampeders. He joined the Stamps in 1989 and had the best training camp of his life. Coach Larry Kuharich kept track of how many plays a player missed, how many blocks a player missed, how many passes a player dropped and how many fumbles a player had. Through the whole training camp, Butch only made one mistake, he dropped one pass. That's how he ended up making the team. 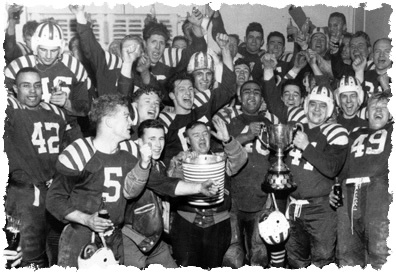 Butch's first regular season game was at Regina's Taylor Field against the Saskatchewan Roughriders. It turned out to be his last. He was on the field for the opening kickoff, and the ball came right to him. He was running with the ball and had a big grin on my face. All he could see was open field. He knew it was six and he knew no one was going to catch him. He made a cut to the right and then tore his hamstring before anyone touched him. He hobbled about 15 or 20 yards before he actually hit the ground. That injury ended his professional football career. Later that season, he was released by the Stamps in 1990. He gave it one more shot with the BC Lions in 1991, but the hamstring injury wouldn't go away. "Coach Bob O'Billovich pulled him aside and said I can tell you're hurt. I'm going to let you go home and heal it and I'll call you back in four or five weeks," But I told O'Billovich not to bother. I knew I was done playing ball. Butch is currently a Bank Manager for ATB Financial and is married to Angela and has two boys Dominic and Jaden. Half his life has been spent in Canada and Calgary now and he really enjoys coaching both his boys in all their sports activities. Drafted by the Chicago Bears in the 5th round (138th overall) of the 1987 NFL Draft. He started his career in the NFL, playing for the Chicago Bears in 1987, where he was a linebacker. Will Johnson #81, defensive lineman, 1989-1996 — Johnson was selected as a West all-star six times (1990-95) and a CFL all-star five times (1991-95). He won a Grey Cup with Calgary in 1992, was named the team's top defensive player in 1991 and 1994 and was named to the Stampeders' 50-year Dream Team in 1995. 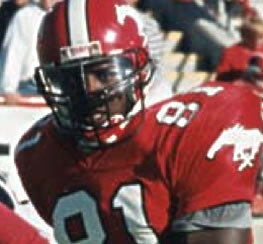 Johnson ranks first on the Stamps' all-time list with 99 quarterback sacks and recorded a career-high 17 sacks in 1995. He led the team in sacks four times, tied for the lead once and was second once. The defensive lineman notched 288 defensive tackles and 11 fumble recoveries during his eight-year career.